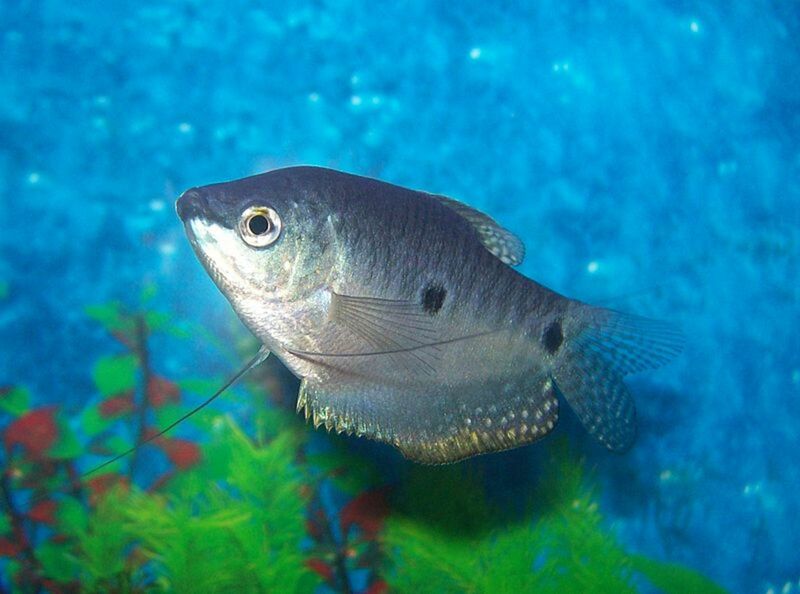 I have spent over 40 years caring for and breeding tropical fish. 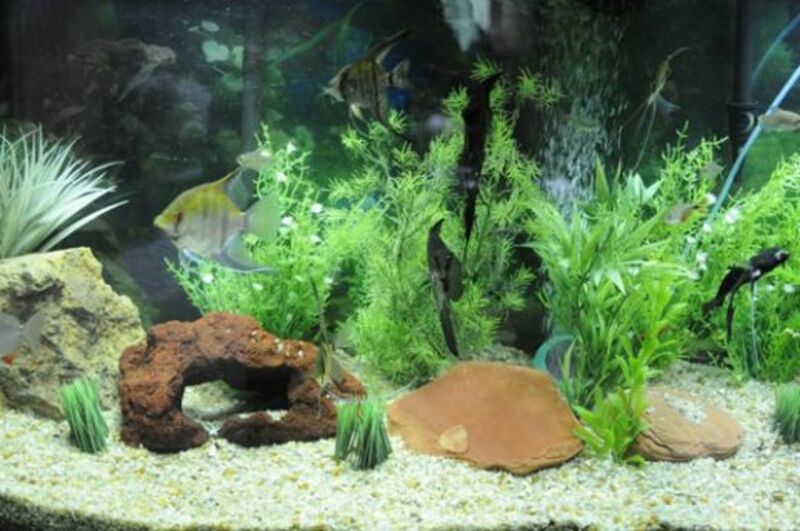 Over 30 tanks breeding Angel Fish, Tiger Barbs, Discus and other.. Tank in need of a water and filter change. 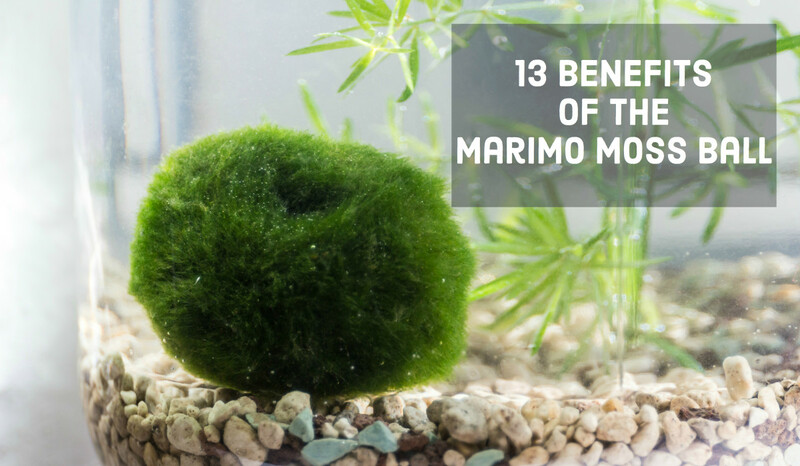 Once you have an established aquarium with fish, plants, rocks, decorations, filters, aeration, then you need to keep the water quality where it has to be to maintain life in your aquarium. Obviously mechanical filtration is a must, but many don't realize that the water quality will become quite poor as the fishes waste and decayed food (which becomes Ammonia) will increase the build up of nitrate (NO3) a harmful chemical that will build up to lethal levels if left unchecked. Think of a water change like you would imagine a hard rain in the Amazon or a flowing river always bringing in fresh clean water. A water change is no different and I personally do one each week. 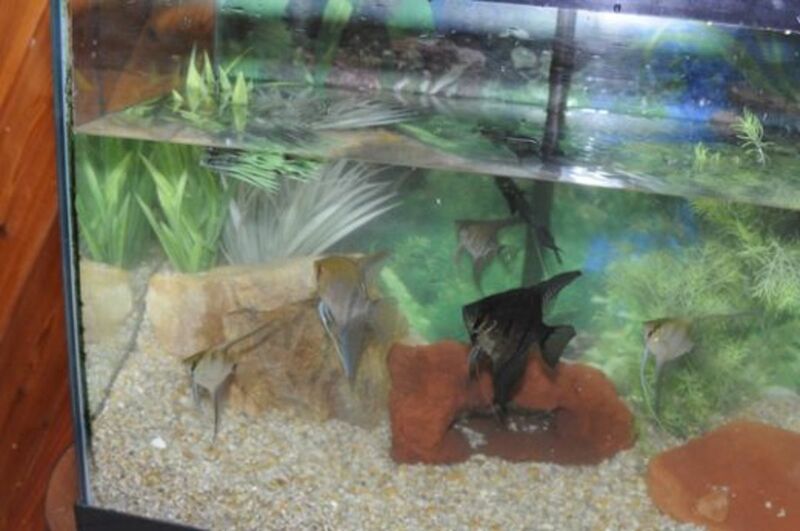 I have a 55 gallon aquarium with 6 very large angel fish, 2 large Silver Dollar fish and about 15 smaller fish like tetras, catfish, barbs. 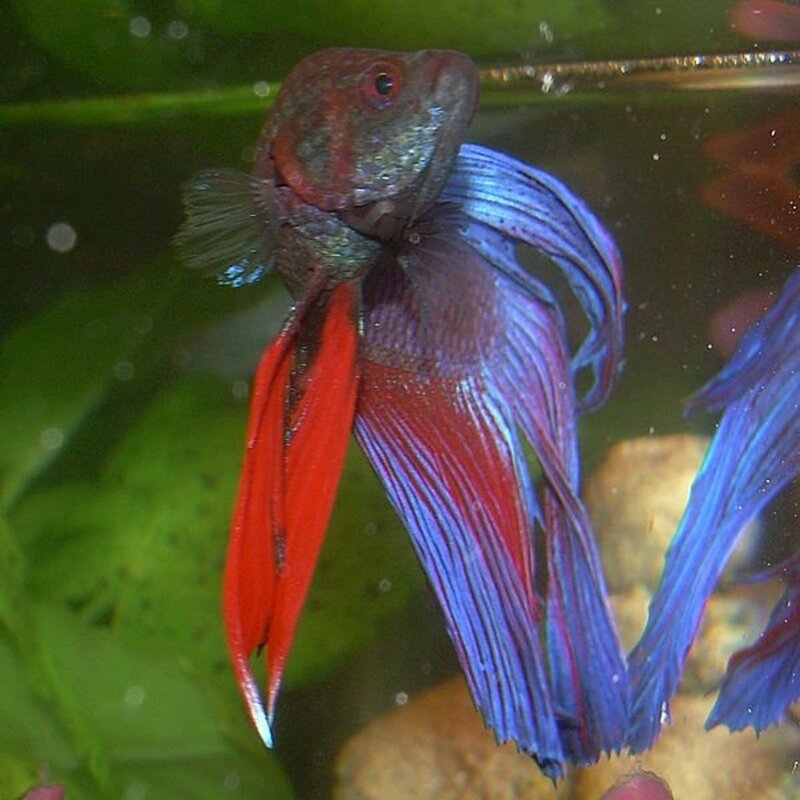 Because I feed my fish frozen food every day, either blood worms or brine shrimp, I have to be careful and not miss a weekly water change or the tank will be put under stress. Determine one day each week that you will perform your maintenance. I like to do mine on a Friday so I can enjoy looking at my nice clean tank on the week-ends. I use the plastic buckets I bought at Home Depot or Lowe's for around $3.50 each. I use one for the water only and the other for the plants and rocks I clean. You may have to remove some of your live plants and gently clean them in the sink, but this is usually something you won't want to do for fear of disturbing the roots, etc. Never use bleach on live plants, it will kill them. There are two sets of instructions below. You will see the letter A for the simple water change instructions and the letter B for the complete water change. I hope it is not too confusing. I am only going to clean the glass in the tank and remove the algae. 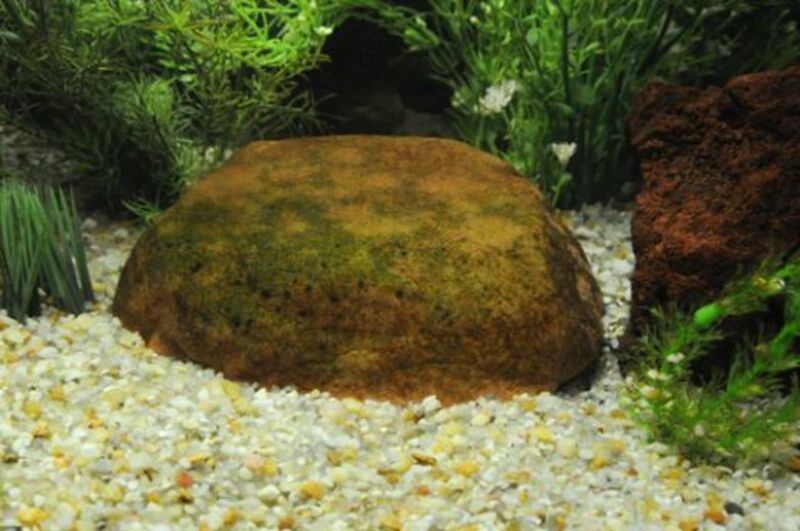 I then take off the glass cover of the tank and use my gravel vacuum to remove 20-30% of the water with gravel sediment. 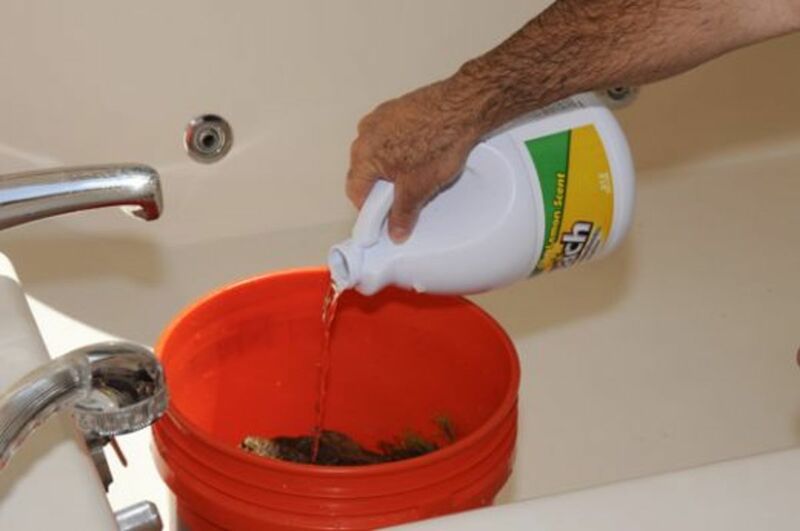 On a complete water change, I will clean my glass as above and then remove all plants, rocks and accessories that have algae on them and put them in one of my empty buckets. I will either use the water I remove for my flowers and plants, in and outside of my home. After all it is like liquid fertilizer now and I will remove about 15 gallons from my 55 gallon tank. Thinking Green is a good thing. If you don't want to bother simply pour it in your toilet. You will syphon the water and clean the sediment from the gravel. 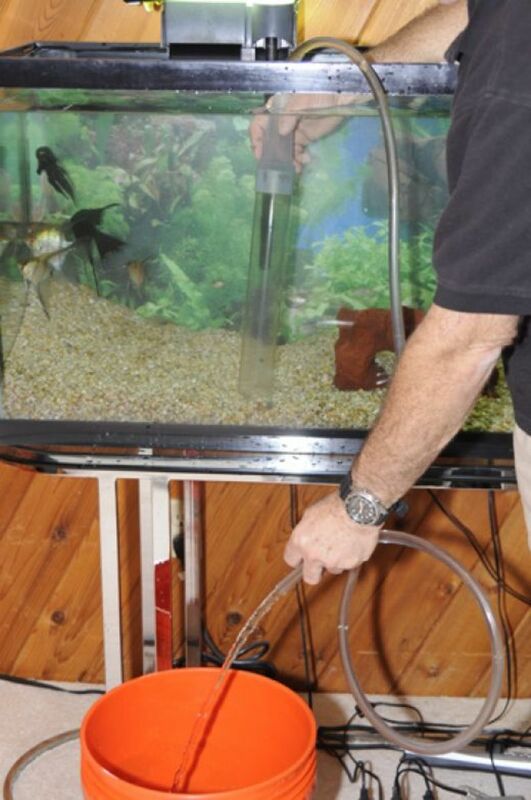 In a complete water change, you will have better access to the entire aquarium floor, so you will carefully vacuum the entire area, you will see all the sediment being removed as it goes up the tube on the vacuum. I do this until it begins to run clear and I have covered the entire floor of the tank. Before replacing water, be sure to plant your plants and replace your rocks and accessories are secure and in place. I now begin to put the water back into the tank making sure the water temperature is about the same as what it is in the tank. I do this by feel and my experience, but if you are not sure use a thermometer to make sure the water is not too cold or too hot. See my photo to see the proper way to pour the water back. 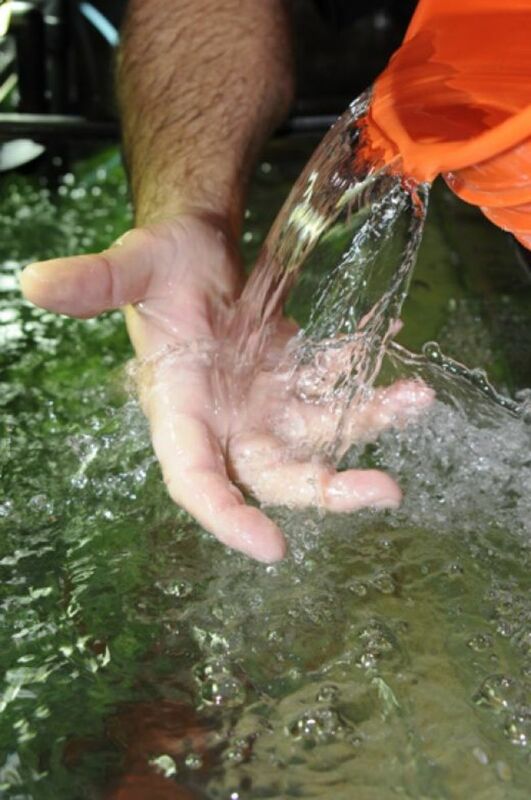 I use my hand to break the force of the water and spread it out so I won't disrupt the gravel or plants in replacing the water. 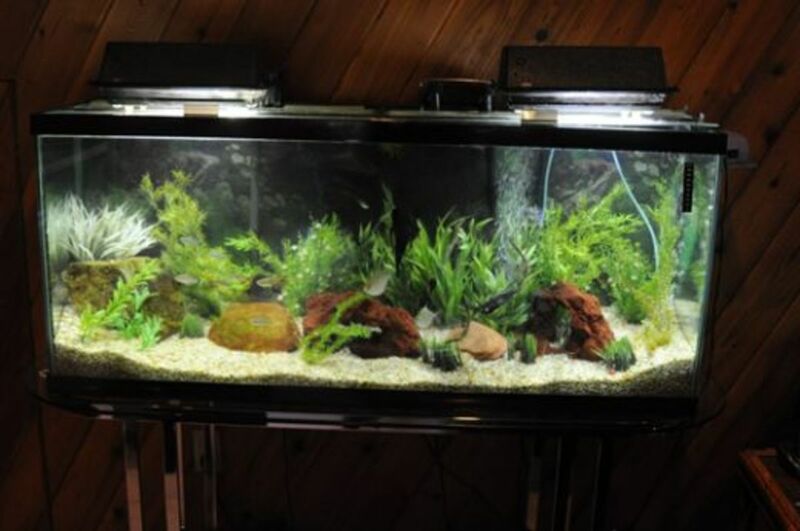 Once the water is back in the tank, you can replace the glass top and you are good for another week. 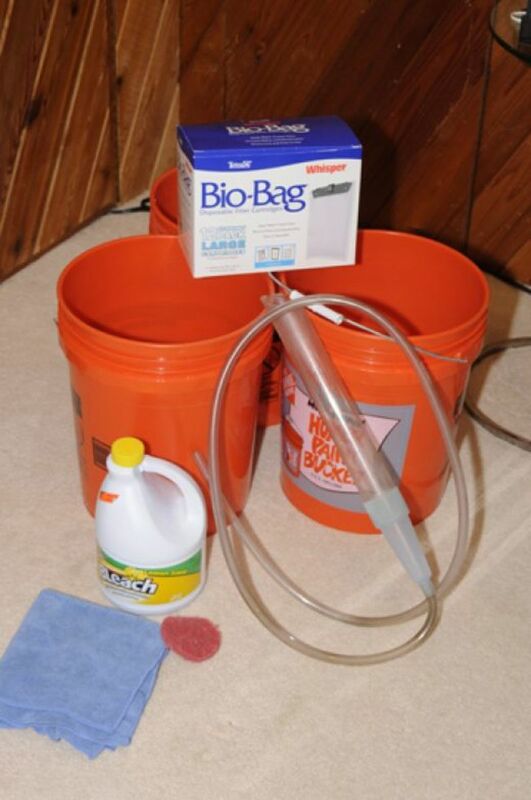 Use approximately 1/2 cup of bleach to your 5 gallons of water. Try less and determine if it works as well. In my complete water change I will do the same, but we need to clean our rocks and plastic plants in a solution of 1 part Bleach to about 30 parts of water. I actually pour about one cup of bleach in a 5 gallon pail that is filled with my plastic plants, rocks, air stones, tubing etc. Once I have the bleach in, I add hot water to fill the container and let it stand for about 15 minutes or until the algae is gone from the rocks and plants. 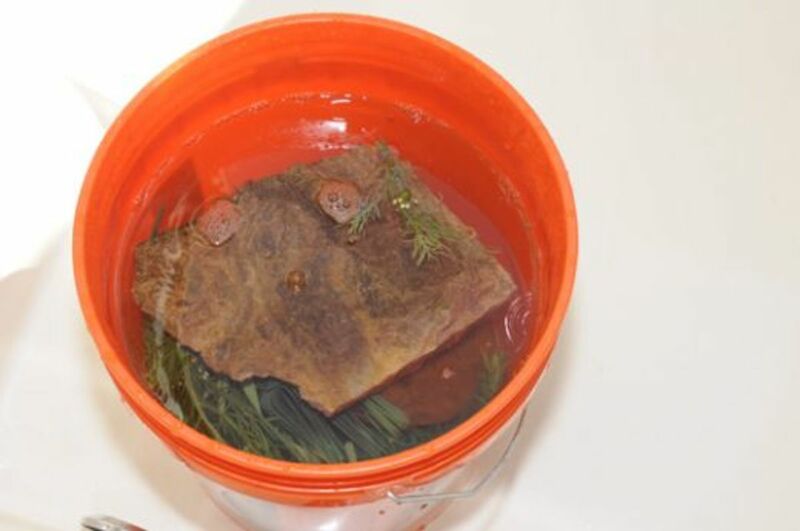 Since they have been soaking in the bucket (I do this in my bathtub) after my 15-20 minutes, I will remove the bucket and pour the water/bleach solution into the toilet and hold my hand on the plants and rocks. I do this so nothing gets poured into the toilet by accident, so do it slowly. I have had a plastic plant go down the toilet so fast, that I couldn't catch it. Fortunately it was a soft plant and went right down. But be careful. 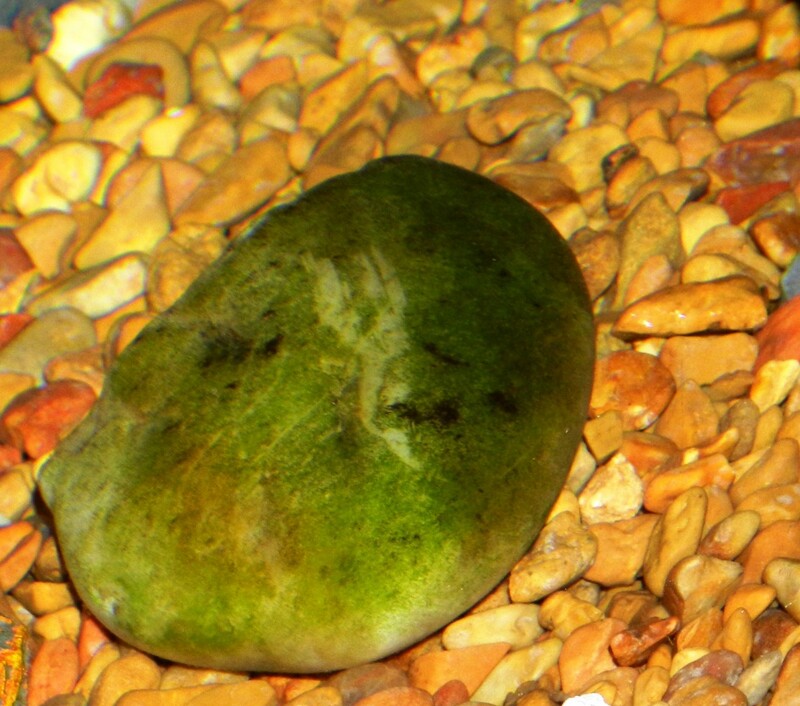 I often take out the heavy rocks and wash those in clear water separately. You can of course dump the water in the bath tub, but then you have to wait for it to go down the drain to refill the bucket. Warning: If you don't completely remove all the bleach from your plants and rocks, you can kill all the fish in your tank. So be sure you wash everything in clear water completely. Be sure to do a few water changes in the bucket. I like to spill the bleach water into my toilet, to clean it as well. Then I take the rocks and plants to my sink and use a brush to clean the rocks if need be. If you want to clean the rocks and accessories better, you can do this in your sink. 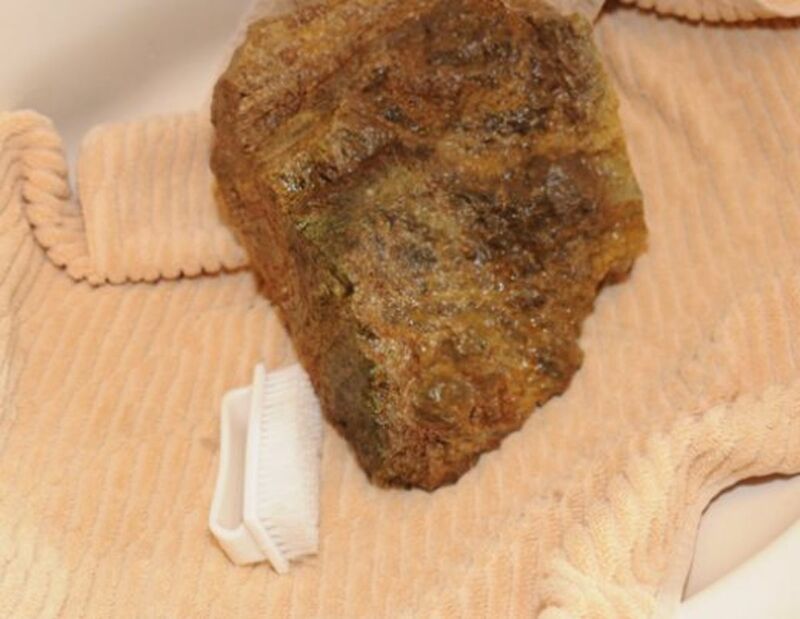 I put in a heavy hand towel in the sink to prevent any scratching or damage to the sink from the rocks. I use a small fingernail brush to scrub the rocks and accessories. When filling the tank, be sure to pour the water on your hand to break the force of the water. In the old days we would pour it over a plate that would break the fall. 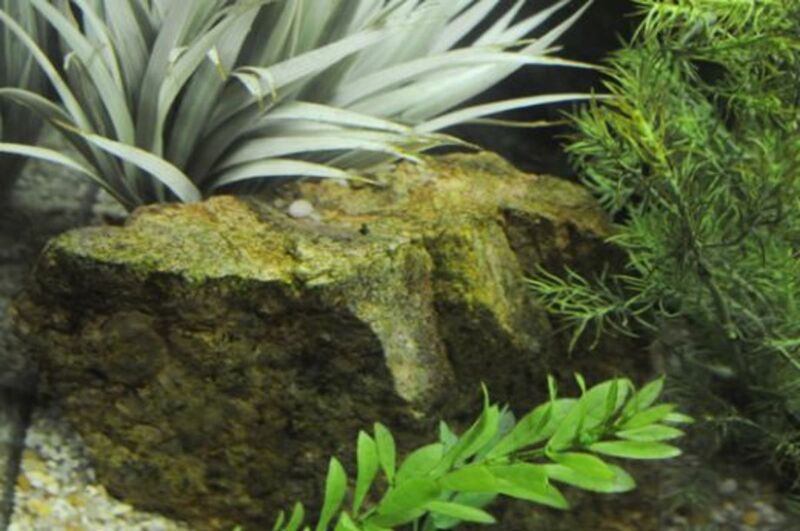 Take the clean plants and rocks and replace them in your aquarium. You may find it easier to do this before you replace the water on a complete change. Some people like to change or clean their filters with fresh filter materials and charcoal every two weeks, so you can do this after a complete change if you like. One suggestion is to wait one day on the filter change. After you do your water change. Let the filter clear out any floating material in the tank that is now floating in the water and then do the filter change. That's it. You just did what nature did with one of those hard thunderstorms in the Amazon River. You have flushed away all the waste material in the tank, you have diluted any of the harmful chemicals and put your system back in harmony. Tips: Don't be too concerned about the amount of chlorine in the replacement water, I will use a little of the chlorine remover sold in pet shops, but frankly, it should not really be a problem since you are only replacing about 20% of the water. I like to put a little salt in the water. I use about 1 tablespoon per 15 gallons of water. 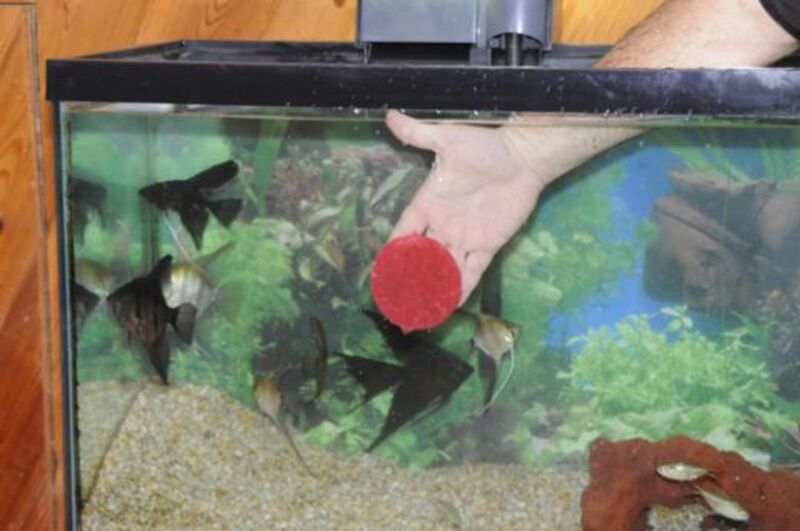 Kosher or Aquarium salt serves as a general tonic and stress reducer for freshwater fish. I have used it for years. 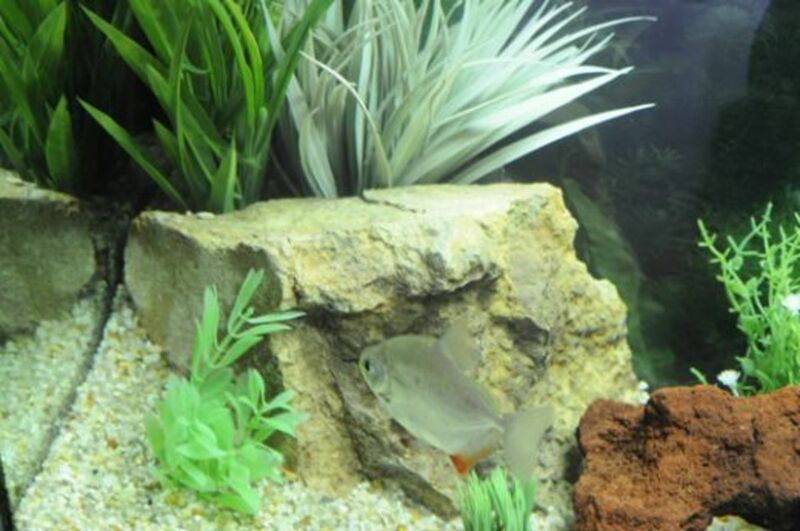 Do not add salt if you are simply adding water that has evaporated from your aquarium, the salt hasn't. 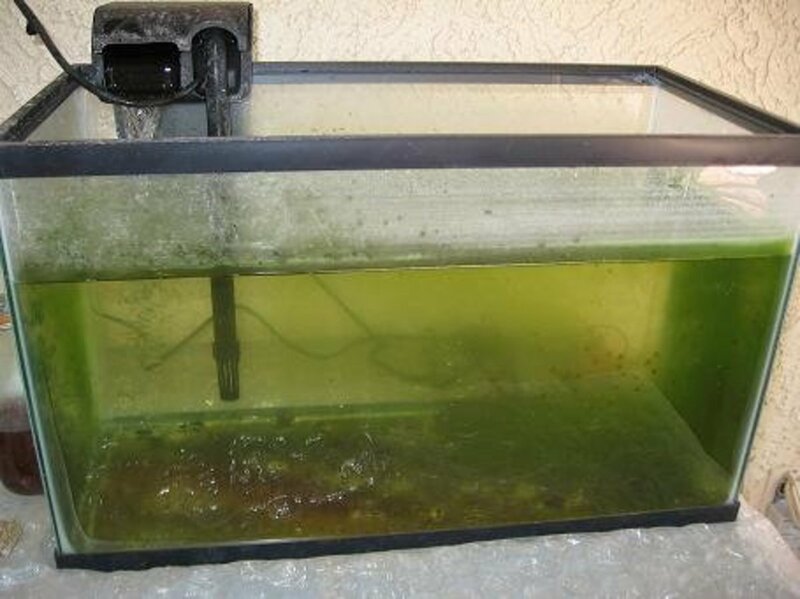 If you are adding a lot of water in a big tank, you may want to use the chlorine remover in the water, small water changes, don't really need to do this. You must wash your plants and rocks completely after cleaning them with the bleach and water solution. 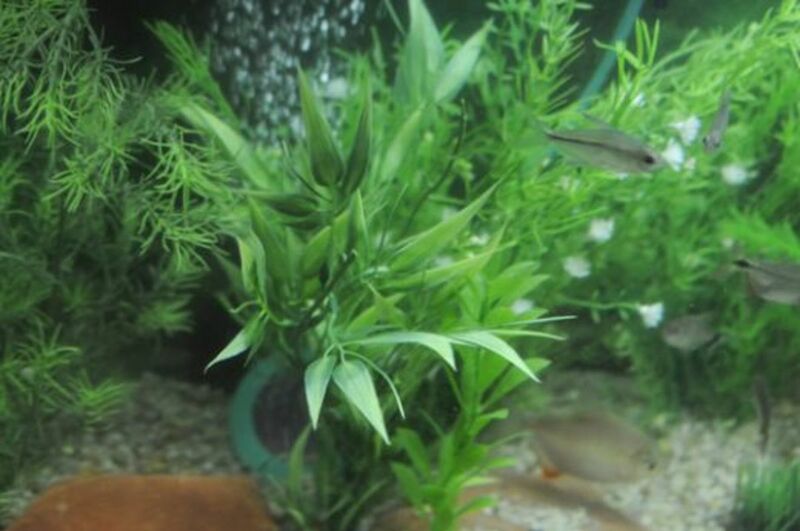 Just wondering how much to feed my fish I have 4 - 2 neons, one little cat fish, and one other small fish about 1 inch long???? My tank is only 10 gallons - a larger tank is to heavy for me to take apart and clean etc - I've had it for two years and it's been pretty nice, but my daughter thinks I feed them too much. I changed the water and used bleached water without knowing. Now the fishes are becoming weak and dull. What to do to protect them? Plz suggest. It depends on your fish in the tank. Generally the temperature for many fish should be between 75-85 degrees. 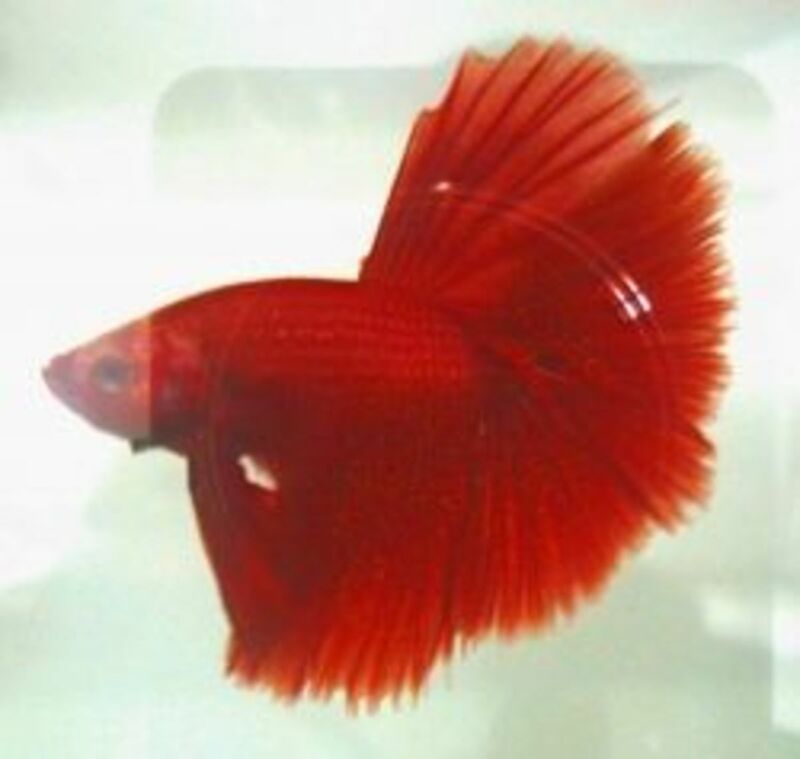 Check with your local pet shop or do some research on the web based on the fish you have. This is a nice detailed guide regarding water changing. I've seen so many hobbyists not change it often enough and it really is a shame. Bravo! Yes this is my only remaining tank. 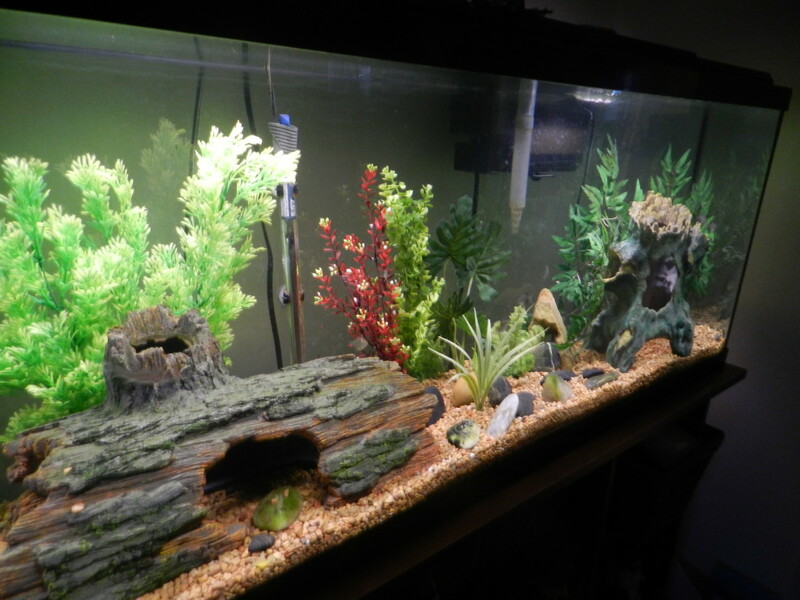 At one time I have 30 tanks, most in my basement and I was breeding fish for sale to local pet shops. Of course now they are all chains and they buy sick fish for pennies and sell them for big bucks. When I was breeding the fish, mine were healthy, raised by hand and not in large vats and ponds and they were huge in size when I sold them.